Book review: Inspiring Impressionism, Daubigny, Monet, van Gogh, by Ambrosini et al. 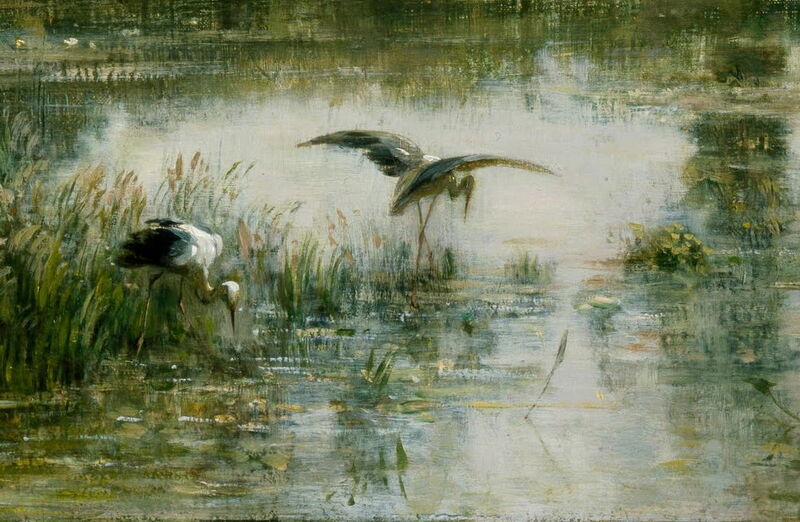 Charles-François Daubigny (1817–1878), The Pond at Gylieu (detail) (1853), oil on canvas, 62.2 x 99.7 cm, Cincinnati Art Museum, Cincinnati, OH. Wikimedia Commons. Little by little, the prescriptive view of Impressionism tightly focussed on Claude Monet and his close circle is becoming broader, and recognising many other important artists and influences. This book, and the exhibitions for which it is the catalogue, look at the importance of Charles François Daubigny, who is otherwise shockingly little-known. Even on Wikipedia, Daubigny (1817-1878) gets little more than a stub entry, and you have to go to Rehs Galleries to read a decent biography. Those fortunate enough to own a copy of John Rewald’s still irreplaceable book The History of Impressionism will be aware of Daubigny’s involvement with the Impressionists, but even there he appears mainly as one of the Barbizon School. If you had to pick the major precursors to Impressionism, his name would probably not go alongside the likes of Boudin, Jongkind, or even Corot. Charles François Daubigny was one of the most important French painters of the nineteenth century. Pause for a moment and list a few dozen really important French painters who created important works during that century, from David, Ingres, Delacroix and Courbet through to the Post-Impressionists, and she really is proposing a place for him among the gods. The central theme is that Daubigny helped to redefine French landscape painting, leading it to the naturalism which enabled Impressionism. Ironically, it was the success of Impressionism, coupled with Daubigny’s relatively early death, not long after the First Impressionist Exhibition, which has resulted in his suppression. The Impressionists benefited greatly from Daubigny – from his riverbank compositions and flowering orchards, his sketchy facture, his emphasis on painting en plein air, his favourite locations, introduction to the dealer Paul Durand-Ruel, and of course from his support when he was a member of the Salon jury. Having laid down this grand challenge, Ambrosini takes it up in the first chapter, in which she provides the first detailed biography of Daubigny in the modern literature. There she corrects the claim, I think based largely on Durand-Ruel’s memoirs, that Daubigny was a pupil of Corot, and suggests that they became friends from 1849 or earlier. Daubigny’s first real success in the Salon came in 1852, with The Harvest (1851), now in the Musée d’Orsay. 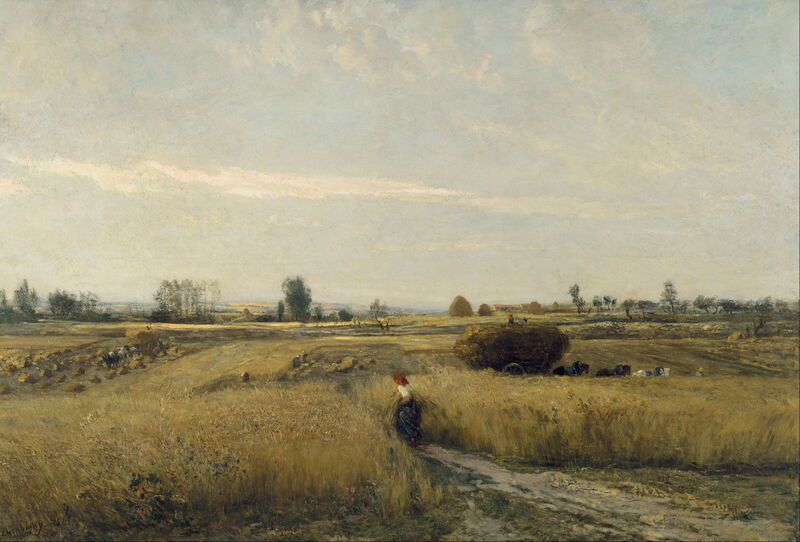 Charles-François Daubigny (1817–1878), The Harvest (1851), oil on canvas, 135 x 196 cm, Musée d’Orsay, Paris. Wikimedia Commons. Ambrosini uses a superb large image of detail from that painting to establish how Daubigny’s use of colour anticipated the changes to come in Impressionism. 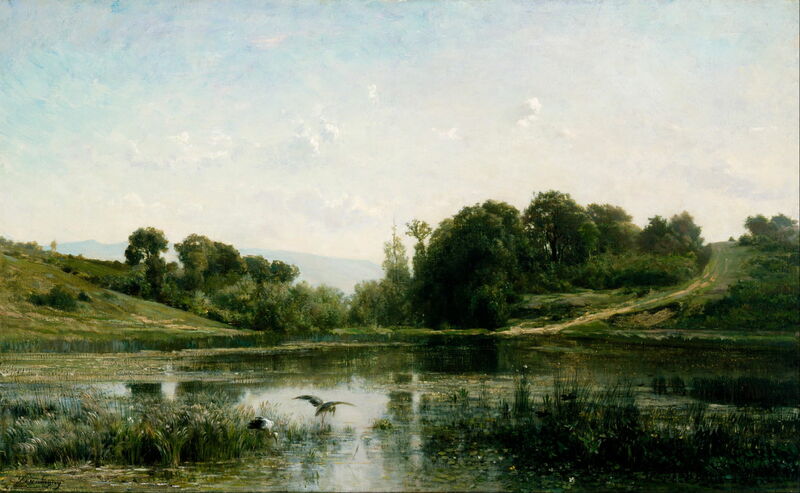 Charles-François Daubigny (1817–1878), The Pond at Gylieu (1853), oil on canvas, 62.2 x 99.7 cm, Cincinnati Art Museum, Cincinnati, OH. Wikimedia Commons. The following year, Daubigny’s Salon success was The Pond at Gylieu (1853), shown in a marvellous spread in this book, and one of the highlights of the exhibitions. This earned him a first-class medal, and was bought by Emperor Napoleon III. Daubigny then developed the painting of riverbanks, particularly in the Île de France, something which continued for the rest of his career, and was adopted by Pissarro, Monet, Sisley, and other Impressionists from the early 1870s on. 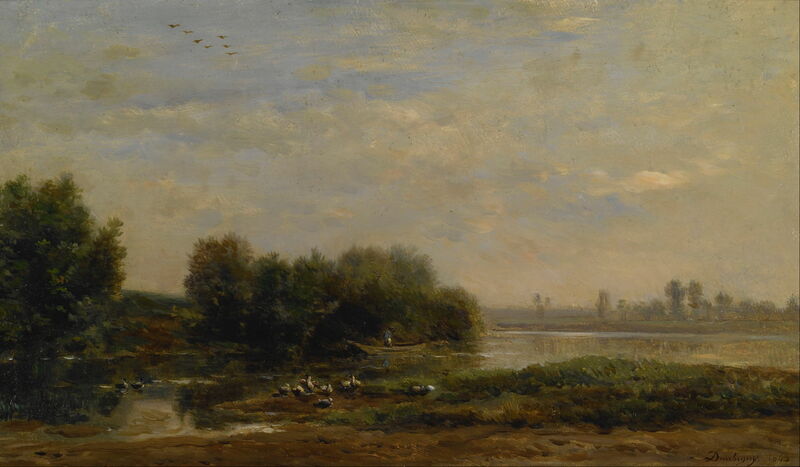 Charles-François Daubigny (1817–1878), Banks of the Seine (1855), oil on canvas, 35.2 x 54 cm, Art Gallery of South Australia, Adelaide, Australia. Wikimedia Commons. Another theme which was to become popular with the Impressionists was that of orchards in blossom, which he introduced to the 1857 Salon, long before Japonisme developed almost a decade later, although at about the same time that Félix Bracquemond claimed to have stumbled across Hokusai prints wrapping Japanese porcelain. Daubigny’s growing success enabled him to invest in two studio innovations: the first was a floating studio, in his boat Botin, which he used from 1857; the second was his construction of a studio on land which he had purchased at Auvers-sur-Oise, laying the foundations of the artists’ colony there, which in turn enabled van Gogh’s final prodigious two months of painting. 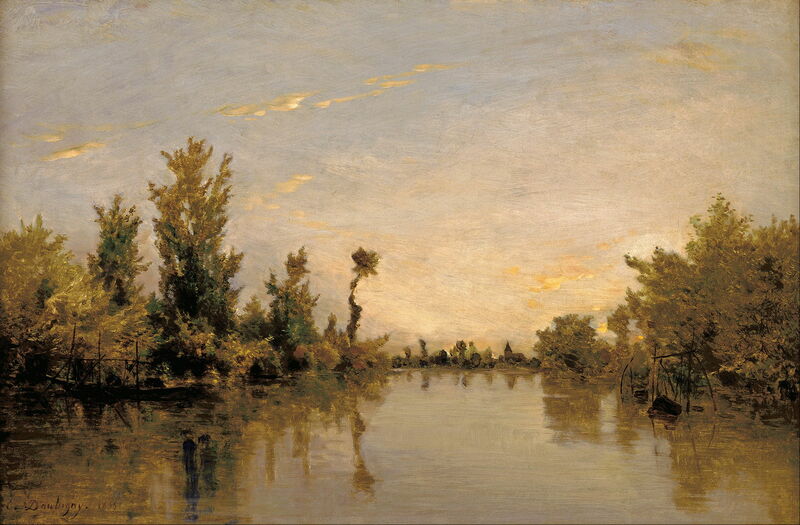 Charles-François Daubigny (1817–1878), On the Oise (1863), oil on panel, 22.9 x 38.1 cm, Indianapolis Museum of Art, Indianapolis, IN. Wikimedia Commons. He fled to London with his family in 1870, to shelter from the Franco-Prussian War, and there introduced the young Claude Monet to Paul Durand-Ruel (who had specialised in the market for Corot, Daubigny, and others of the Barbizon School), who in turn introduced Pissarro; on Durand-Ruel’s return to Paris, he signed up several of the Impressionists. Charles-François Daubigny (1817–1878), Moonrise at Auvers (1877), oil on canvas, 106.5 x 188 cm, Montreal Museum of Fine Arts, Montréal, Canada. Photo courtesy of Musée des Beaux-Arts de Montréal, via Wikimedia Commons. Although Daubigny had long explored fleeting effects of light, it was in the 1870s that he painted 25 moonlit landscapes. 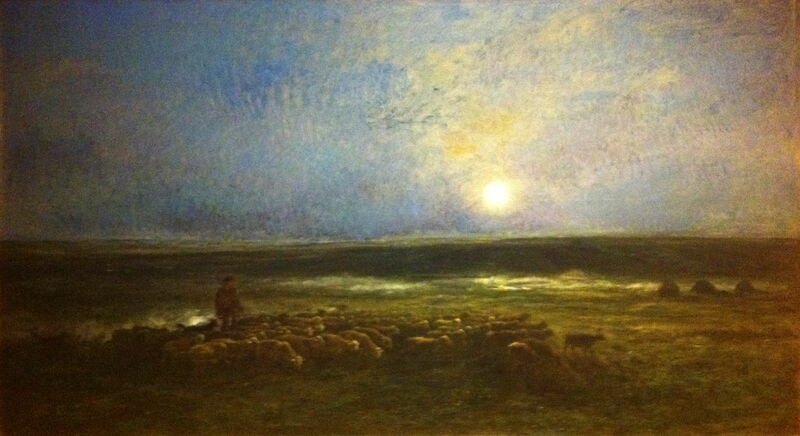 Among them Moonrise at Auvers (1877) shows some of his most remarkable chromatic effects. The second chapter, by Maite van Dijk, examines in more detail the relationship between Daubigny and the nascent Impressionists during the 1860s, and starts showing direct comparisons between their work which dominates the rest of the book. She tells how Monet was impressed by Daubigny’s work in the 1859 Salon, but they did not meet until slightly later. Van Dijk also traces the role that Daubigny played in making the 1868 Salon a great success for the Impressionist ‘youth’, and the wrath which he incurred as a result. What I had not realised was that, once Daubigny and Monet had fled to London in 1870, Daubigny co-arranged an exhibition there which included Monet’s paintings, and it was that which led to his introduction to Durand-Ruel – which differs from the latter’s rather vague account in his memoirs. Michael Clarke provides the third chapter, which examines Daubigny’s river scenes and their influence on Pissarro and Monet, in particular. This includes a detailed and delightfully-illustrated account of the floating studio, and comparisons with that acquired later by Monet. Lynne Ambrosini returns for the fourth chapter, covering Daubigny, his dealers, and the art market of the day. Given its detail and neutrality, it bears comparison against Durand-Ruel’s own memoirs. In Chapter 5, Frances Fowle traces the development of Auvers-sur-Oise as an artists’ colony, from its effective foundation by Daubigny, through the frequent visits by Impressionists including Berthe Morisot, Pissarro, Cézanne, Guillaumin, and Renoir, until Vincent van Gogh spent his final two months on earth there in 1890. In addition to showing some of the paintings they made – which make fascinating comparisons – she includes a photograph showing the painted walls of Daubigny’s studio: this is now a national monument, and one which I will put at the top of my list of visits for my next trip to Paris. I was also not aware of how great an influence Daubigny had been on Vincent van Gogh, the subject of the sixth chapter, by Nienke Bakker. Daubigny was on van Gogh’s list of favourite artists which he compiled in 1874, when working for Goupil. Bakker makes some excellent visual comparisons, particularly depictions of poppy fields by Daubigny (1874), Monet (1881), and van Gogh (1890); it is a pity that she did not stretch to that of de Nittis (1881) too. The final chapter, by René Boitelle, presents a superb account of the technical aspects of Daubigny’s paintings. He was unusual in that he quite often altered the dimensions of standard-size canvases, and sometimes painted en plein air on huge supports, including one 3 metres (presumably) long. Daubigny also used palette knives for painting, increasingly so after 1870. He was a very early adopter of paints using cadmium pigments, something which few of the Impressionists could afford until well after his death. End matter consists of a concise chronology (2 pages), excellent detailed endnotes with references to the literature, and a six-page bibliography which is bang up to date and in itself a unique resource. There is a list of exhibited works, which is of sadly limited value as it does not refer to any of the book’s illustrations. This book’s only flaw, and it may be increasingly common but here is very serious indeed, is its complete lack of any index. If this were a catalogue for ‘just another’ exhibition of Impressionist paintings, then its absence might be insignificant. However for most of us who purchase this book, this is our only printed information about Daubigny. Being unable to look up discussion or even inclusion of his paintings by title shows utter disregard for the reader’s needs. When compiling this review, I needed details of some of his paintings which might have been reproduced here: the only way that I could check for them was by thumbing my way through the entire volume. As there is not even an electronic version available through Apple or Amazon, searching for references to Morisot, for example, is simply impossible. I understand that indexes add to the cost of books, but they add disproportionately to their value to the reader. This would be insulting enough had this book been published by a regular commercial publisher, but this has been published by the Scottish National Gallery (and the sister galleries taking part in the exhibition). Lynne Ambrosini’s bold challenge is a good one. Although I hate ranking artists by ‘merit’ or ‘importance’, she is right, Daubigny is one of the most important French painters of the nineteenth century. Unless something truly miraculous happens, this is likely to be the only book that I own which covers Daubigny’s work, influence, and importance. I shall treasure it, and feast my eyes on every single painting which it illustrates. I look forward to my trip to Edinburgh later this year to the exhibition. Should you buy it? Yes (and I would have been even more positive had it had an index). I will probably end up with two copies, so that I can keep one in pristine condition. And if someone out there is working on a catalogue raisonné, please put me down for a copy of that too. Daubigny, Monet, Van Gogh: Impressions of Landscape, Van Gogh Museum, Amsterdam, 21 Oct 2016 to 29 Jan 2017. Posted in General, Painting and tagged Corot, Daubigny, Durand-Ruel, Impressionism, Monet, Morisot, painting, Pissarro, van Gogh. Bookmark the permalink.